Trogon Photo Tours History - Nate Chappell was interested in animals and birds from a very young age. He was exposed to photography at an early age through his father, Dr. James Chappell, who was an accomplished amateur photographer - at one point Dr. Chappell won the Tacoma News Tribune photo contest 5 years in a row. However, Nate was a bird watcher for many years before he became serious about photography. Before his first trip to Namibia in 1999 he bought his first SLR and telephoto zoom lens. From that point on he was hooked and took many bird photo trips to Thailand, Australia, other international locations and in the US. During his first trip bird photo trip to South America in 2004 he met Angie in the Quito, Ecuador airport. They were married 9 months later and after taking a few more trips to Ecuador they decided to start Trogon Photo Tours to share their love of photography, nature and Ecuador with others. Trogon Photo Tours first nature photo tour was to Ecuador in December 2007 and their first bird photo workshop in the US was to Green Valley, Arizona in May 2008. Since that time Trogon Tours has led many tours to Ecuador, South Africa and other parts of the world and numerous photo workshops in the US. When we are not leading tours we are often scouting locations for possible new tours and workshops. Nate and Angie were blessed with the birth of a beautiful daughter, Natalie in August 2010. Mission Statement - Trogon Photo Tours mission is to lead high quality photographic tours and workshops at reasonable prices. One of the ways our commitment to this principle is shown is that if we have 5 or more customers on any US workshop or photo tour of more than 3 days we will have 2 photography instructors. These are people who are top photographers in their area of nature and wildlife photography so they know what it takes to make a great photo and can communicate that to you. This ensures you get enough personal attention. Each tour or workshop will have at least 1 photographic guide who has spent a lot of time in the country or area that we are visiting. If it's an area that we haven't been to we will be honest about that and call it an "exploratory" trip in the trip description. On our private photo tours we work with the best local photographic guides all of whom Nate has previously met and worked with before. A testament to the value we deliver our customers is that well over 50% of our customers are repeat customers. INSTRUCTORS - Nate Chappell is one of the top bird and wildlife photographers leading photography tours and workshops. He is an expert at most aspects of avian photography including flight photography, using flash and multi-flash for hummingbirds. He has been a bird watcher for over 30 years and has seen over 3,000 species of birds and photographed over 1,500 species. 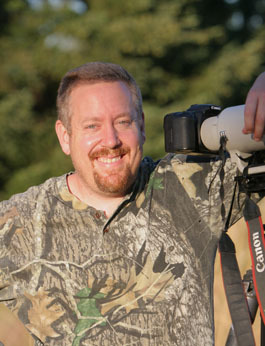 Nate enjoys teaching bird and wildlife photography and he is known for being able to simplify complicated topics. His photography is currently represented by several top stock agencies including Minden Pictures, VIREO and Birdimagency. Angie Chappell grew up in Ecuador and worked for 3 years as a travel agent for Tower Tours there. She has a great love for wildlife and nature. Nate, Angie and Natalie (their daughter) live part of the year in the US and part of the year in Ecuador. Charles Gangas is a full time nature photographer residing in Stowe, Vermont where he is a staff photographer for the Vermont Center for Ecostudies. Chuck's images have been used in the popular IBird applications. Chuck has traveled and photographed extensively throughout Asia and Latin America. Guilherme Battistuzzo is a full time nature photographer, birding guide and biologist living and working out of Sao Paulo, Brazil. He is regularly near the top of the list each year for number of birds seen in Brazil and in 2016 he was named one of the top 15 bird photographers to follow on Instagram by Audubon magazine.